3. Using an immersion blender, blend the mixture until smooth and thick. Add creamer or milk and maple syrup. Mix well. Season with salt and pepper again, if needed. 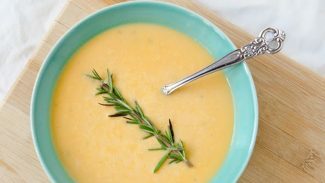 Keep the soup warm over low heat until ready to serve.